The week after previews but before the Prerelease is an odd one. Everyone is combing the Card Image Gallery taking in the newest cards, but we're still a week from getting to play with any of them and two weeks from being able to purchase any. If you're like me, you can only satiate this feeling by brewing, playing some Commander, and biding your time until you can get your hands on your new favorites (Ugin, the Spirit Dragon and Soulfire Grand Master, I'm looking at you). But this in-between time gives us at DailyMTG.com a chance to look at the bridges between the two sets, and Khans of Tarkir and Fate Reforged reference each other almost manically, daring you to find all of the subtle bridges between them. So today I want to highlight one of my favorites. Two Golems, similar-looking builds, 1,280 years apart. But there's even more to it than that. Let's look at the full art as well as the art descriptions for both. Action: Show an ancient golem of ornate stone. It was built over 1000 years ago, and it's showing its age. Its stone is cracked in places, and the carvings have become worn smooth or broken off. Still, it's an impressive golem, over 12 feet (4m) tall. Mood: A guardian from ancient times, now showing its age. The flavor text shows its age as well, and it's some of my favorite from the set, as it succinctly sums up the last 1,280 years. 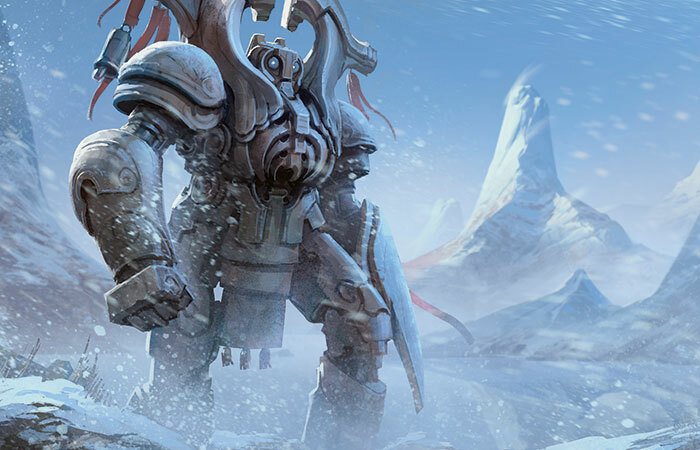 It strode through the clash of dragons, the fall of Ugin, and the rise of the khans. Location: In a Jeskai workshop. 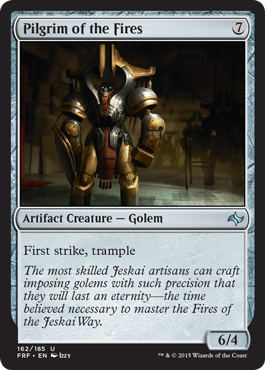 Action: Show a golem that has just been completed by Jeskai artisans. The scaffolding has been removed and the golem has just been activated and has taken its first step out into the world. There is some room to play with here—maybe the golem was once painted, maybe it was polished stone or gilded metal—up to you how to interpret the golem's original state. Mood: A celebration of a life's work. 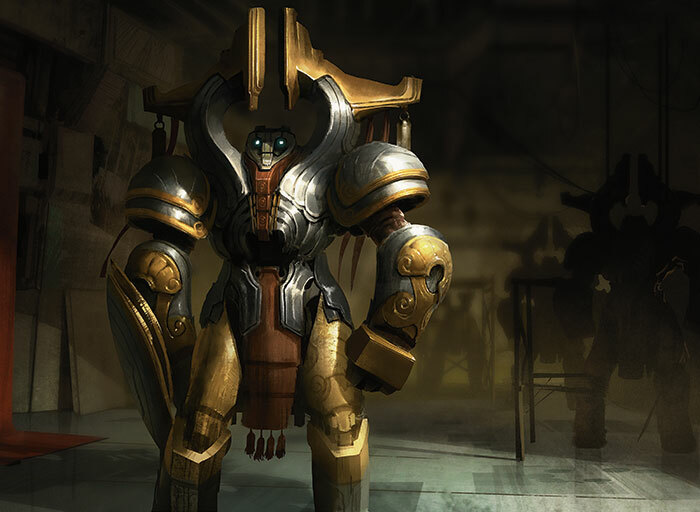 Notes: This golem is the one depicted on the Huey card Witness of the Ages. This one should look exactly like it but just newer. So the Golem in Pilgrim of the Fires is the Witness of the Ages. It's a bit sad, in a way, viewing the younger version of this time-worn golem, but it's just one of many cool bridges between Khans of Tarkir and Fate Reforged.